Deadlines are a highly effective means of boosting your sales. What if you could have an authentic evergreen deadline for everyone you marketed to? Or an email-integrated waiting list that closed and opened by itself? 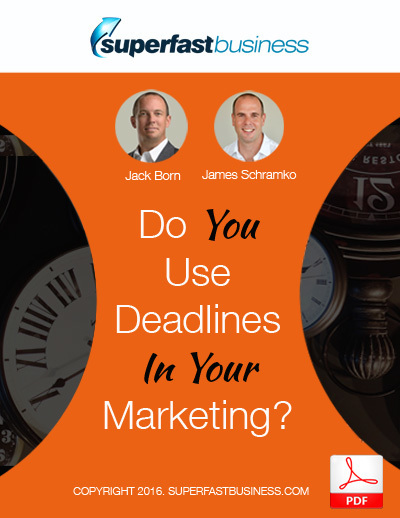 James Schramko and Deadline Funnel’s Jack Born discuss how these are now possible, as well as other ways of leveraging deadlines in your marketing. Download the PDF transcription and Do You Use Deadlines In Your Marketing? James: James Schramko here, welcome back to SuperFastBusiness.com. Today, we’re talking about marketing tactics, and for that, I’ve brought on a special friend of mine, Jack Born. Welcome, Jack. Jack: Great to be here, James. James: Jack Born is from DeadlineFunnel.com, and is somewhat of an expert in the two main tactics of urgency and scarcity, which you will have heard a fair bit about if you’ve been in the online community for any length of time. Lots of people refer back to the work of Cialdini, we’ve heard about it in every product launch formula for the last decade, and what we really want to do is talk about these two things in more depth and see how you can get a few tips that you might implement into your own marketing from now. And I’ll also share some results that we got using Jack’s Deadline Funnel software because it was certainly interesting to me, and there’s a few little tips that I learned along the way that you might be able to implement into your marketing as well. So Jack, where should we start? Jack: Well, I was thinking one place that we could start would be where I first left corporate America and started my online business. And for that, we have to roll back the clock quite aways to about 2002. And I’ll keep the story short, but it really was my first introduction into deadlines. Now, this was before Jeff Walker had codified the Product Launch Formula, this was before everyone was doing product launches. I really didn’t know what I was doing, and frankly, I made a lot of mistakes. And so I sent out a few more emails, and really nothing happened. My wife and I started picking up the phone and making phone calls, and really, that didn’t do a whole lot of good. So I figured, well, before I call it quits, I’m certainly not going to say, “Oh, just kidding, you can continue using it for free.” This was also my first introduction to the power of authentic deadlines, which we’ll be talking about I’m sure a lot more, the importance of being authentic. So, I decided, before I shut this thing down, I’m going to cut off access and see if that gets people’s attention. And it did. $20,000, actually about $25,000 of money rushed in when people emailed me frantically, saying, “I don’t have access.” I said, “That’s right, you don’t. You didn’t pay. So here’s the link to pay.” And so they immediately signed up. what I found out later was that a lot of the folks who were using the website were not the ones who had the corporate credit card, so they had to go ask for the corporate credit card, and they didn’t want to do that until they actually had to. So that was the power of having a deadline. All those sales rushed in on that last day, and then that really was my springboard to give me the monthly recurring revenue that I needed to be able to hone my programming chops, and my marketing chops, and to continue working on my own. And that led to a whole host of other doors opening for me. But that was really the beginning, and so when I trace back where did I first experience the power of a deadline in a marketing setting, that would be it. That was a real eye-opener for me. James: Nice. So you got the result. I guess in my old world, when I still had a job, I was the general manager of the Mercedes-Benz dealership, and from time to time, we would hold events. Like in the showroom, we would try and engineer events, and not the tacky sausage sizzle, hessian around the thing and party streamers but more stylish. I would have things like an AMG event where we bring in every model just for the weekend, and we would bring on-site value as to be able to get more competition going for the customers’ trade-ins, and then we would market it with a combination of different marketing channels. But the effect was that people in the showroom on the weekend when there are lots of other people around and the end of the weekend is coming, it just creates a frenzy. It was truly unbelievable that a car that would sit there for a year or a year and a half with no attention, you could put that in the middle of the showroom with the “was” and “is” sticker on it. You know, was this much, is now this much. And it would sell just like that. We would sell a huge amount of volume in just a few days because we created this event atmosphere. And then of course, after the event, it goes back to normal. There were a few things that I took out of that. One of the tricky ones is how do you create a sale event without bringing forward your whole market and decimating your future sales. Hopefully, we can talk about that as well. Jack: Absolutely. And I know that you’ve advised a lot of your clients on how to do a launch, and you’ve done your own launches. I worked for many years with Perry Marshall, we did launches for him. Also, I’ve seen the results behind the scenes of lots of different launches and so I can say across any niche, any vertical, any marketplace, regardless of what type of launch it is, you see this burst of sales when the event first starts but then that dies off and things calm down a little bit. And then there is a bigger burst of sales right at the end. I’ve seen this time and time and time again. One of the last promotions that I did for Perry, we were trying to generate revenue in the month of December, which for him is always just historically a slow month. It’s just the way that his list reacts. And so, expenses don’t go down, you still have employees, and so, I was charged with pulling off a winning promotion. So we dusted off a really great course called Consulting Accelerator. We put a new webinar on it, and we put it out there. First-day sales were not that spectacular. We actually thought we had a turkey out of the box. But then on the last day, $40,000 of sales came in out of a grand total of $50,000. So it’s that type of surge of sales at the end that you’ve seen time and time again and I’ve seen time and time again. It really just ties into human nature. I mean, first of all, it’s just human nature to procrastinate. I wish it wasn’t that way, but I procrastinate. Maybe you don’t. You’ve got systems and processes, but most people procrastinate. They put off decisions, especially purchasing decisions, until the very last moment. And then the other thing that it ties into is what the scientists call “loss aversion”. They’ve proven time and time again that we as humans are hardwired to really pay attention to situations where we’re going to lose something, even more so than we’re going to gain something. We might have time to go through a few examples. Some of them have nothing to do necessarily with marketing. But in the health space, all sorts of different… Weird studies have been done that show, I think with absolute certainty, that we are hardwired to avoid losses more than we are to seek gain. So that’s the other thing that deadlines, urgency and scarcity tie into, is that desire for us not to lose something when something’s being taken away from us. So right at that deadline where there are only a few hours left, that’s what I’ve started calling the perfect persuasion window, because, in any sort of promotion, product launch situation like that where there’s a hard deadline, it’s that last, let’s say 12 hours before the deadline, where your revenue per email sent, your revenue per email open, your revenue per click, your revenue per visitor is higher than any other time during that promotion, whether it’s a product launch, doing a Black Friday sale, Cyber Monday sale, Christmas sale, a birthday sale, it doesn’t matter. If there’s a deadline, it’s in that window of time right before the deadline that you’re generating the most revenue per minute, per email, per open, per click, etc. James: Right. So I’ve dabbled with this in a few different environments, but I know what you mean about missing out. It was actually kind of a secret satisfaction of people who are selling motor vehicles when a customer would come in to buy the car that they’d been deliberating on, and delaying, and procrastinating with, and someone else had already bought it, and you’d get to deliver the news. “I’m sorry but that’s actually gone.” There is this shock or reaction because they thought they were holding all the cards. I imagine it’s that sense of loss that would drive them in their future decisions to be less of a procrastinator. But it certainly is up to the seller to engineer the right conditions to help the customer make a decision if it’s good for the customer to have that product or service. I think that’s where some of the ethical sides of creating deadlines come into it. You’ll hear people when they’re talking about selling. 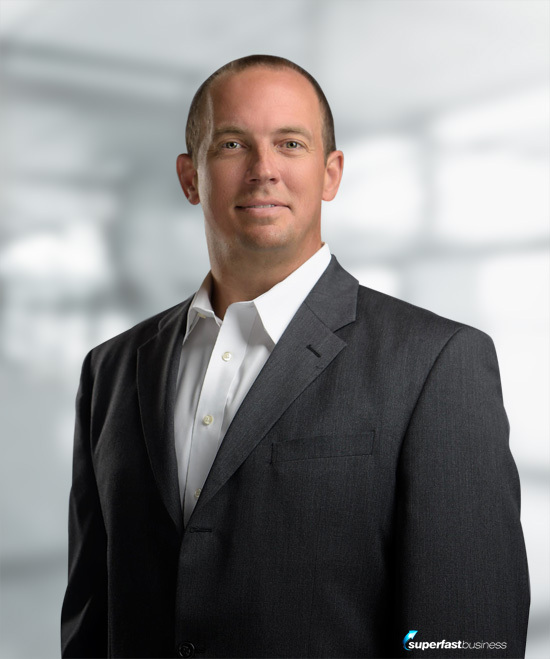 Guys like Dan Kennedy, for example, will say that you owe it to your customer to sell to them, because they’ll be better off if they take action. So anything you can do to convince them to go forward is doing them a favor. I think if you can engineer an environment where the customer feels compelled to take action now, that sort of falls along the lines of what the copywriters teach. John Carlton, I think, was the first copywriter to mention to me that you’ve got to create a deadline. And as you stated before, it is human nature, whether it’s as a kid when we’re putting in our school homework, the night before it’s due, we work on it. When we’re running events as adults, we tend to be doing things at the last minute unless we have extraordinary discipline and checklists and new psychological awareness of how to do these things. As a business coach, I’ve seen that a lot of people, even if they’re driven, still have trouble prioritizing things so that things get done in ahead of time. And they will often bump up against deadlines. We’ve all had that customer, especially if you’ve ever had a service business, who is trying to order things at the last minute or change things when it’s urgent. I had one customer like that in our website development business, whose every single job he had was always urgent. The customer urgently needed this, they had to have this thing by tomorrow because of this amazing scenario that just unfolded. But it was only that customer. Other customers were able to plan. I imagine that person would be more susceptible to a deadline scenario where it’s in or out, that they would be so used to it, that their whole life is living on a deadline. And to a large extent, people who draw a wage generally spend a little more than they earn. They bump up against credit card reminders, and rent reminders, and school-fee reminders, and car-payment reminders. So they’re constantly having to be in this sort of deadline zone. So when you’re competing with those things, and you’re just trying to sell something, I guess engineering a scenario that people are more used to makes sense. Jack: Yeah absolutely. I think that at all socioeconomic levels, people are motivated by deadlines because your message, your marketing message has to cut through all of the competing marketing messages out there. It has to break through the noise. So a lot of times, I know when I’m going through my emails, I see something that I want, but I’m just busy. I’m not going to go get my credit card and buy it right now. It’s when I see that subsequent email, “Hey, tonight is the deadline. You need to get it now,” that it reminds me, Oh yeah, I need to go ahead and take action on this. By the way, let me drop a quick tip, hopefully, this is just the first of many, but quick tip is that when you have some sort of product promotion where you’ve got a deadline, and you should always have a deadline, then on the day of the deadline, you need to send more than one email. I’ve talked to some people who think, isn’t that a law – you can’t send more than one email a day? People are going to unsubscribe. I’ve also talked with other people who send literally a dozen emails on that last day. What’s the right number? It really depends, but I would say if you’re sending one email per day, and the thought of sending two a day makes you nervous, you need to start with two. So add another email on that last day. It’s going to bump your sales. And if you’re already sending two or three, add in another one and see what happens. If you’re sending 12 on the last day, you don’t necessarily need to add another one, but you know, what the heck? What difference would it make between 12 and 13? But my point is to send an additional email on the last day. James: By the way, if someone’s listening to this and they’re sending 12 emails, please slap yourself for me. That’s obnoxious. That is outrageous. It’s not very respectful of your consumer. James: There are some marketers who do that. Jack: I’m not advocating 12 emails. James: No. I just want to be clear about that. This show doesn’t endorse that kind of behavior. James: We just had Cyber Monday and Black Friday. I’m looking in my filtered-email section here that I reserve for special marketers. Some of them sent five or six emails the day prior and then four emails on Cyber Monday. And when I go to their offer page, and it’s past Cyber Monday I think, their countdown timer is stuck on one second. It was exactly that yesterday as well. (Bleep) is not using Deadline Funnel, by the look of it. James: Yeah, to me, I think well, it’s totally bull**** and lacks credibility. So you’ve got to be very careful if you’re going to put in the effort to bombard people with obnoxious emails, you can’t have false scarcity where you’re pretending that it’s going to be taken down and then you don’t. Jack: Right. And so going back just a few years, I found myself in the position of wanting to put together an evergreen campaign. I was working on one campaign for myself and one for Perry Marshall. I realized it would be great to have an evergreen deadline. But not one that counts to zero but you know it just stays at zero… I really wanted it to be fully, fully integrated into the follow-up emails that we were sending, have it across different pages, and the last thing I wanted to do was to go and build it. So I went about searching for solutions that would do this and came to find out that nothing did even close to all the things that I wanted it to do. And so I decided, well heck, I’ll go and build it because I have programming chops and marketing chops. I set about building it and that’s how Deadline Funnel came to be. And so, that’s what I wanted to build into Deadline Funnel. I wanted to build the technology so that no matter what sort of funnel someone was using, whether it was a series of emails leading to videos and sales pages or emails that went straight to a shopping cart, or a VSL, or a webinar, no matter what sort of funnel someone wanted to build, if they wanted to have an authentic evergreen deadline that was assigned as people went into the funnel, and it was authentic, it was genuine, it was just automated, then that technology didn’t exist and so that’s why we set about building Deadline Funnel. So the reason why I bring that up is because you were mentioning some people who had a countdown timer that just sat at zero, and that was the opposite of what we wanted to create. So having authenticity and doing what you say is incredibly important because your actions are either going to increase your credibility or they’re going to detract from your credibility. If you’re going to be in business, in any sort of business for any period of time, you’re not going to be able to build your empire based on one sale. It’s going to have to be one sale and that builds a relationship. And based on that relationship, they’re going to go into the next thing that you offer them either with more trust and respect for you or less trust and respect for you. And if it’s less trust and respect because of how you sold them the first time, then it’s going to be a lot higher hill to climb in order to get that sale, whereas if you build your trust with someone in the way that you sold to them and market to them, the second sale, and the third sale, and the fourth sale is going to be even easier. James: Right. So how do you handle people who contact you after the deadline is finished? So when it was a wash for us or there are no financial incentives, just doing a favor for the client, that was a situation where I did give them an exception. But for most people, it’s “Sorry, you missed it.” It adds trust and credibility going forward. James: Right. So I’d love to share just what we’ve been doing with Deadline Funnel, because it replaced the function that we were doing manually, and I think that’s important. Going way back with my membership, when I first started my membership, it wasn’t long until we switched it onto a waiting list. We found that having a waiting list was good because we were able to test different funnels where people came onto the waiting list and what emails they got to join and when they joined, and then we could test pricing, like releasing from a dam. That was good. And then when I went on to my second membership, it was just open to the public all the time. It sold pretty well. It was selling more or less a membership a day on average with just organic marketing that we do with our podcast, etc. We’ve been testing Deadline Funnel, and we’ve run it a few times now. With the current membership that we have, it’s definitely been on a waiting list. Partly because I want to regulate the flow of new members. I need to control who’s coming in because one thing I’ve learned about running a recurring subscription business that most people don’t focus enough on is it’s better to spend time looking after existing customers. That’s the overwhelming majority of my focus, is just serving existing customers and making sure that they want to stick around, because if you can plug the holes in the bucket and reduce churn, it makes your job a lot easier when it comes to the marketing, and it increases your reputation because you get results for people. Some people have been members for a long, long time. In fact, our average membership is running somewhere around the region of 28 months, which is phenomenal, really, in a market where people would have you believe that an average membership is somewhere around three months. So I’ve spent so much time on that that we would just manually open and close the membership. So we would literally turn on the sales page and then go and broadcast email to let our customers know that we’re now taking new memberships and then after a few days, we would then let them know that it’s closing and then we would close it. It was very simple except that it’s manual, and we had to do this occasionally when we were ready to take on some new members. Because the surest way to get people to leave a community is to add in a whole bunch of new members without letting them know, you know, that shock of changing. Imagine like tipping a glass of cold water into a jar of water. You notice the difference. So by having that regulated and sequenced opening and closing, we were able to let people know we’re about to open. There are some new members coming. It was all good. And then what happened, we built up quite a substantial waiting list because we made some changes to our membership. We improved the quality of the coaching. I opened up a private personal coaching discussion so that I can personally coach people. And we also integrated an app to make it much easier to use, following some of the tips that I got from reading Simplify by Koch and Lockwood. So that went well. And then the next thing is we thought, well, speaking to you, we could probably automate our opening and closing just to make it a little bit easier. Really just to automate something we’re doing manually makes sense. So what we did do is we set it up and your team was very helpful. They set up Deadline Funnel with my web developer who had quite a few questions, and we want it to work right. We set it up and we sent out our first round. Basically, we’ve done I think four rounds now. This is just so we keep pace with my coaching and the community is not disrupted in a severe way. But yeah, gee, we had some interesting results. Some people have sat in multiple rounds where it’s opened and closed while they’ve watched it. Other people have just joined from the first round. Some things that we’ve noticed for sure is that a lot of people bought after the first email because they’ve been waiting. About 38 percent bought after the first email when we did that recent round and then not many people bought after the email number two. Like in one case, zero. And what we realized was that we must never, ever send the exact same email. So we can’t send the same deadline funnel. It didn’t work for us. And then on the third email where the email was different again, we got the bulk of our sales. Sixty-two percent of our sales came in that third email before we closed. When we went to round four, we basically had 15 percent of the people bought after the first email, 15 percent after the second, which was now different, and 70 percent bought at the third email. So what we’re finding time and time again is that the bulk of our sales happens just before it closes, which is what you would predict. That’s really the difference between when we just opened and closed before because when we opened and closed before, there wasn’t anything in particular driving it. For example, we did have a countdown timer, which we manually put there, but it wasn’t hooked into the emails, and it wasn’t as tight as it is now. It was really just sending out an email and then closing it. So we sold, I think, quite a lot less than we sell now. We’re selling substantially more. In fact, what we’ve worked out is we’re selling three times more using the Deadline Funnel software than manually opening and closing it just because it’s so tightly integrated into the emails. We’ve worked a little bit on refining the way that we do it. We now have three separate deadline funnels and then a fourth sequence, which I call “get off the fence.” So what we have learned is that the most sales come from the third email. That if we send the same email, we don’t make any sales because they’ve already seen it. They’re starting to feel like it’s a pattern. If you only send one email, it’s definitely not effective. So I believe sending multiple emails would definitely increase your results as you mentioned. Some people have gone through four rounds, three rounds, two rounds, or just the first round. We actually sell the most on the first round and the second most on the third round and then the third most on the fourth round. So some people will go around all four rounds before they buy. Internally, we’ve called it an A, B, C, and D sequence. So every person, if they arrive to our site and join the waiting list will be placed in the A sequence. At the end of that A sequence, if they don’t buy, they get put into the B sequence, which is a new set of emails. If they don’t buy on the B sequence, they go through the C sequence, which is a new set of emails. And then if they don’t buy after three deadline funnels, we move them into the fourth sequence, which is decision time sequence. It’s like, “Hey listen, you haven’t for whatever reason purchased up until now. So let’s go ahead and call it how it is. Either you want to join or you don’t, but let’s not pretend anymore.” So it’s like, “Here’s where you can go ahead and join. If you can scroll down the bottom, just take yourself off the waiting list so that you don’t get these notifications anymore.” And then we remove them from the sequence. So they would have to re-opt into the waiting list to get back into the access to the membership. There’s just been a few other little side effects too, which have been really interesting to observe and that is I’ve had a significant increase in existing members from SuperFastBusiness membership who want to refer a friend or get a business partner or what have you to join. They’re aware of the waiting list, and I have told them that if they would like to refer someone, they can skip the queue because they’re a referral from an existing member. They contact our support at SuperFastBusiness.com, and they get a direct link where they can go and purchase without having to wait. So my main point there is for the right type of customer, if there’s a compelling reason, they can go straight to the head of the queue with a fast pass. The best person to send me a customer is an existing customer because they already know what it’s like getting coached by me. They already have access to the training recordings. They already get involved in fantastic conversations with this long-standing mature membership where the average members have been there for more than two years. So it’s a very safe and expert place for people to hang out. So if they want to send a friend then I don’t want to force them to a longer path or delay the sale as we would call in the sales industry. Jack: Right. There’s a lot of information in the last 10 minutes for anyone running a subscription, especially a membership site. Congrats on having a 28-month average lifetime. I mean that’s incredible. Because I know some of the details behind the scenes, one thing I want to add in that I didn’t hear you mention, if you did, I just want to underscore, and that is that you’re not taking people right from three selling emails directly into three selling emails on B, etc., etc. There’s time in between. James: Yeah, there’s definitely time. We’ve changed the time around. But in terms of our current setting, I think we’re sitting somewhere around 23 days, which means that we’re roughly opening once a month. And what I’ve done is build my routine around when we open because we had such a big waiting list pouring in at the same time the first time we opened. And those people all moved in that cohort into the second round and then the third. It’s like a python eating a rabbit. It’s moving along in a big lump. So there are certain peak times when we open, and there’s a bunch of new members coming in. But I’m ready to capture them and to set them up with their own personal coaching and to get involved in what they’re up to and to interact with them. So I was able to schedule myself around that. Over time, and it might take a while, I think they’ve had to go through all four emails, but over time, it will even out a little bit. It’ll just be the right sort of regulation. So now, we move to the secondary reason for having the deadline and a waiting list. Firstly, it’s got a great effect on churn. Our churn is roughly half what it was two years ago. Our churn, just in case people are curious, for October for example, was 2.3 percent, which in any subscription business is a respectable churn rate. It used to run at more like four, sometimes five percent. So the way that you bring members into a recurring subscription business, the way that you set them up, that you frame them, that you allow them to buy will have a dramatic impact on when they leave or if they leave. Having a waiting list helps existing members stay because they feel they’ve got access to something that is harder to get, which is true. so that reduces churn. Second thing is people who wait for it seem to expect it more and are more willing to pay our annual membership, which is the only way we sell the membership now. We switched from monthly to annual sometime early this year. And now, I’ve switched shopping carts. It allows me to accept PayPal, AMEX, Visa, or Mastercard. So we’ve opened up the payment methods, we’ve restricted it to just annual, we’ve made it a better price than it used to be paid monthly, and it’s still selling really well. So people are asked for a one-year commitment, but the type of person who commits to one year of training with me can’t lose. They just can’t lose if they actually participate. It will be impossible not to get a massive return on investment. So those people seem to appreciate it and in the emails that we send out in the sequences, they’re establishing the way that they’re going to get value. One of the emails specifically mentions – “Imagine if you open up your phone, whether it’s an iPhone or an android that you open up your SuperFastBusiness app, and you are right there discussing your business with me. It’s that close. It’s like having a coach in your pocket.” And this positioning has helped our conversions increase for sure. But the reason that we initially were opening and closing was definitely because I needed to be there to respond to new members as they come in so that I’m not missing out looking after the people who are already members, who are always priority number one. An existing member always trumps a new application. But when I accept a new member and they come in, then they become an existing member. So they need to be served. So I have to serve everybody. Now I want to set the environment that makes sure we got the right customer. It doesn’t hurt that they need to wait. And it doesn’t hurt that they get a proper sequence of what’s included in the membership and then they have time to go over the sales offer. They’ve got days to go over it. And then if it closes, then they can wait until we open next time. And as we’ve seen from our tracking so far, a large number of people will buy on the second, or third, or fourth time we open. And then they drop off the waiting list, because if they’re not compelled to buy after four rounds, then they’ll have to wait again and rejoin the waiting list. They’d really have to do something special to opt themselves back in because there’s one thing I don’t want to be doing as a coach. I don’t want to be driving someone to be successful for themselves. If they don’t actually want to improve, it’s such a waste of energy for me to try and put that thing in them. That’s the vital ingredient that they have to bring to the table. Jack: Yeah. So I would just want to mention, I was smiling when I was listening to this, the folks that miss out on the first round, round A, those are like the folks that you were talking about at the car dealership, where they figured that car was going to be on the lot, and then they realize that car was sold yesterday. Then they realize that you mean business. And that’s the power of authenticity with your deadlines even though it’s automated because I know from working with my team and your team behind the scenes that you now have everything all set up to be on automated in your CRM, and it’s tied in with your sales pages, and it’s tied in with your checkout pages, and so everything’s all automated. The setup has been done, and it’s just a finely-tuned machine with four stages, A, B, C and D.
That brings me to something that I wanted to mention. We talked a lot about launches, we talked a lot about product promotions, and the power of deadlines when you’ve got this live event. You have this cart closed. What a lot of our Deadline Funnel clients have found, and the reason why they came to us, was because there’s a somewhat of a revenue roller coaster if someone’s business is really dependent on launches. Now, I am in no way trashing launches. Launches are great for a number of different reasons. But I think a lot of people, once they get over the high highs of the money coming in from the launch and the dust settles, they realize, it’d be great if there was some way to continue the momentum after that launch. Again, going back to why we created Deadline Funnel, it was so that someone could, with authenticity, run an evergreen funnel, so that as people come in, they’re assigned a deadline. And that’s kind of different than the way that you’ve used it, but the cool thing is that the software gives you the flexibility. You James, you use Deadline Funnel in the way that you described in great detail. And that was amazing. Other people can run it where someone comes in on Monday and their deadline is Friday or Saturday. Someone comes in on Tuesday, and their deadline is going to be Sunday or Monday. And so it’s that revolving door, but every single person’s deadline is authentic. And so what people find is that they can run a mini-launch every single day. It’s in no way the same effort of putting together a full-scale launch, but for each person coming through the funnel, you can send them through a series of emails that helps you bond with them and it gives them that aha moment and really develops that know you, like you, trust you that Kevin Rogers talks about. And then you make them the offer. And if the offer has special bonuses, or bonuses and a discount, or one or the other, and there’s a deadline, then you have that spike in sales because it’s that deadline that gets a lot of people off the fence in making the decision that they might have eventually made, but it would’ve been months down the road. And by then, a significant portion of them would have forgotten about it. They would’ve moved on with something else. So that’s the power of being able to automate it, is that anything that you can systematize and automate, you can monitor, you can improve, and it frees you up to also devote time and energy and focus on other aspects of your business. James: Yeah, I think that’s how we’ve moved to that type of purpose, which is where people get their own personalized deadline. That’s been stage two for us. But stage one was definitely automating that, which we were doing manually. Dean Jackson talks about that. His ideal automation is something that you would do if you were going to do it personally. You’re just leveraging automation to clone yourself in a way. So we used to open and close it manually. We’ve now been able to set it up that that happens without any effort from me or my webmaster so that we can move on to working on other things. In my case, solving problems for people in my coaching community is a higher-level thing for me to be doing. And for my webmaster, she’s rolling out our Ask methodology, which is going well. So our next innovation is we’ve added a chooser to our homepage, which is just a micro-bucket segmentation. Interestingly, we’ve got more opt-ins by adding one extra step. So I was surprised but delighted with that result. Our next stage is to make four versions of our A B C D deadline funnel. So I’m going to make one per bucket. So we’re going to end up with probably a large machine in the background. But once it’s set up, and I’m sure your team will help my team figure out how that works, [laughs], once it’s set up, someone at the very front door will be put into a bucket-specific, category-specific deadline funnel A B C D sequence. The main thing is we’re really happy with the results. Our membership has now got more subscribers than it had a year or two ago, because we’ve topped up with multiple openings now, and it’s really thriving. And this is in an environment where we’ve gone contrarian to most of the market. We got in before Facebook groups. We still don’t have a Facebook group. People are loving the app where they can escape the inevitable black pit of unproductivity that Facebook presents them. I notice now, a lot of the launch gurus, as you mention, launches get tiring. Almost all of them are selling some kind of a monthly-continuity program. The standard is a membership login area where you get infoproducts and then they assist a Facebook group that’s paired with that, and they’re selling these for $39 a month. And the big $2000 product guys and girls are now rolling along with these memberships. If you have a recurring subscription business, and you pair it up with some smart automation of deadline funnel, then you can open and close it. Even Stu McLaren talks about this in Tribe: a membership that’s closed for most of the time will usually outperform a membership that’s always open. So the main concepts here are – you don’t have to always be open.” If you are going to open and close periodically, you could do that automatically. And if you learn some of the things that we’ve learned, you’ll know that some people will go through multiple versions of it and that the bulk of your sales will come just at the end as we predict. I think it’s OK, it’s quite ethical to help a customer make a decision by arriving at this point where it’s up to them to do something to get in or they miss out. You’re actually doing them a favor. I have no doubt whatsoever that people who are receiving my coaching are better off than those who are not. If I can help them make that decision, then that’s good. I’ve used deadlines for a long time. We do an annual live event, and that’s a classic example of genuine scarcity. We have a seat limit for the room that we hire in our hotel that we have sold out our event every single year, and we’re running our 12th big event now. At the time of recording this, we’re in November, and my event is in March, and we are 75 percent full. What we do at the end of each month is we have an email sequence that goes out reminding people that it’s currently the lowest ticket price. The eventual ticket price will be this amount. Currently, you can buy tickets for this lower amount. And every single month, we get a sales bump. So that’s just a simple way to, I guess you’d call it bracket creep. But we have around about six thresholds now leading up to our event. For the six months prior, our tickets go up every single month until we get to the event. And everyone in my community knows this. They know that the earlier they buy the ticket, the lower it costs. And every year, when we open up the first round of sales, we sell a hundred tickets in the first 24 hours. Six months before the event, which is just phenomenal. Jack: Yeah. So you have both scarcity and urgency working for you. So there’s the time deadline but also as you mentioned, there’s a finite number of seats. By the way that you’ve set up what it is that you’re selling, it just naturally lends itself to having a finite quantity that people can buy. People understand, there’s X number of seats and when they’re gone, they’re gone. There’s no more room. James: Exactly. With my online coaching, I’ve got a finite amount of time that I can spend each week coaching people, and I balance the numbers of my community so that everyone can be looked after properly. And never get greedy trying to load it up. The worst thing people can do to their business is to run out of capacity because that damages reputation, and reputation is hard to get and easy to lose. So I think, the event, anyone can see the clear scarcity on that, because it’s an actual limit. The urgency of an event, once it comes and goes, that’s it. It’s gone. And you can’t replace that. The main thing is, look I think, having some of these elements in your marketing will make a huge difference. If you’re not using it, some people are not giving people a reason to buy their product in the first place, and if they are, they’re not giving them a reason to buy their product now. The biggest competitor we have for someone not buying our product is probably them doing nothing, according to Dan Kennedy. So if we can bring that urgency up, and if we can create some scarcity, and if we’re genuine with our philosophy around how we do it, then you should see a lift in sales and your business will be better off. So the main thing that I wanted to say is thank you for creating the solution that has automated something we were doing manually, because it’s worked out really well for us. Jack: Well, thank you for sharing your results, and thank you for having me on your podcast, and for sharing this with your tribe and even beyond. So thank you. James: Great. We also have put our review page up for Deadline Funnel where we talk about what it is and how it’s worked for us. Anyone who buys that from our link, we can also send a bonus training from our back catalog of recordings from our events. Let us know what you are challenged with, and we’ll see if we can find something that creates extra value for you. So we’ve been talking with Jack Born from DeadlineFunnel.com. If you are not using Deadline Funnel, and you have a substantial business, or you’d like to bolt on a recurring revenue to an existing business, even if you’re doing the launch model, or you sell software, or your product’s not always available, then this is going to be a great innovation for you and well worth installing. Hi James, I really enjoyed this episode, thank you. Question – when you open your list for new members do you send out your ‘launch emails’ to everyone on your list, or just the segmented portion that have asked to be on your waiting list?